HR professionals are very familiar with the appraisal process. Appraisal is however superseded by Performance Management. The diagrams outline the process differences. 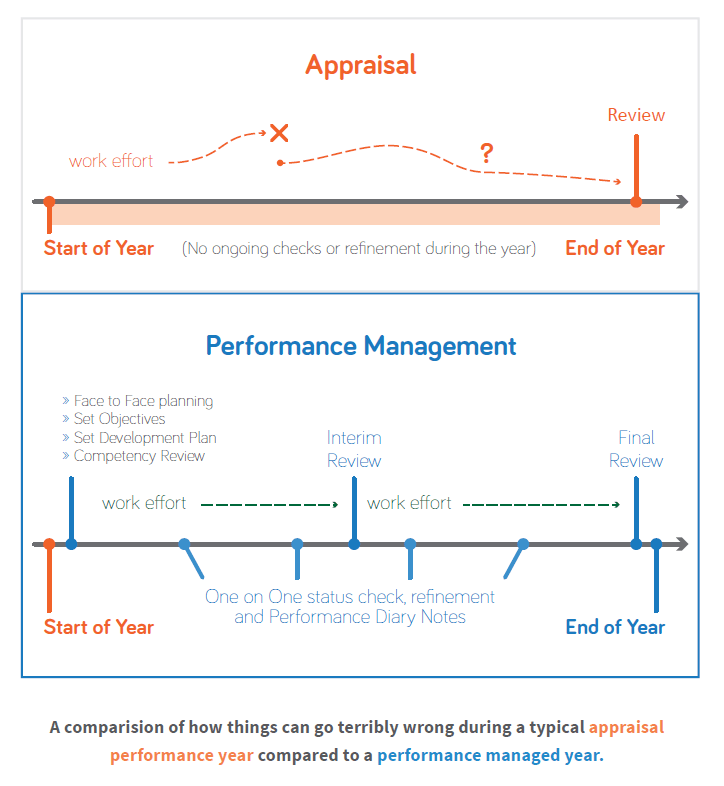 It is clear from these two diagrams that the process is different, Performance Management is a more comprehensive process with more employee manager touch points during the year. Following is a deeper exploration of the major linkages between process and business performance outcomes. The Appraisal process is beneficial for the employee and the employee’s manager. It provides feedback to employees, assists in employee retention and is sometimes linked to remuneration where employees progress through salary bandings where they have good appraisal ratings. Given the benefits outlined above, it is often a surprise to HR practitioners that the appraisal process has little or no support by C Level executives (CEO, CFO, CIO). In talking to C Level executives we often get comments like “yes, we need to do it but it does very little for me” or “the reason everyone does it is to justify a salary increment, it has little or no effect on organisational performance”. Even though these comments made by C Level executives fly in the face of good HR practice, they are however often accurate from a C Level executives’ perspective. C Level executives are charged with delivering business outcomes not ensuring good HR process.